Last year, PCE Instruments launched a new industrial borescope called PCE-VE 700 which is the ideal inspection tool for nearly any industrial sector, for instance for the aerospace and automotive industries and in production processes. It is also very popular in research and development. 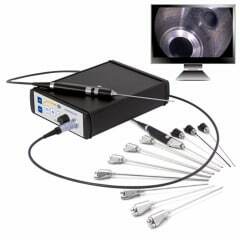 The borescope is available with different probes for different applications, with diameters ranging from 0.7 to 4.0 mm. These must be ordered separately. For better illumination and low energy consumption, the borescope is equipped with an LED light. The images are very clear. The visualisation system makes it much easier for staff to inspect complex parts, for example parts with many boreholes, such as injection-moulded parts, hydraulic and pneumatic components, etc. and saves the user a lot of time. The probes can be changed quickly and easily. One more advantage is that the follow-up costs after purchase are very low. PCE Instruments, with headquarters in Germany and offices in Chile, France, Spain, Italy, China, Hong Kong, the Netherlands, Turkey, Poland, the UK and the US, manufactures and sells test instruments, control systems, laboratory and weighing equipment for a vast range of different purposes and applications, to a great extent under the label "PCE Instruments®", but also from other renowned producers. PCE also provides pre- and aftersales technical advice as well as calibration and re-calibration services.